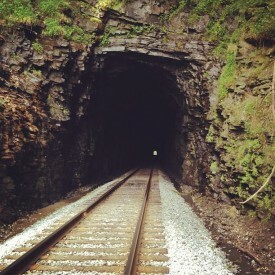 “There’s light at the end of the tunnel.” I’d heard it over and over from many of my friends. I thought about that as I sat quietly in my car without turning the key. I’d learned in recent months that giving myself a moment to think cleared my head, but this time I couldn’t get it together. Everything I’d ever learned couldn’t comfort or help me. I didn’t understand what I was supposed to do—or what God wanted of me. The world moved forward without me, but I didn’t mind. I no longer felt a part of it as if remaining frozen in time would ease the pain or dull the reality of what had happened. For a moment, I considered not going to work. After all, I hadn’t been there for two months. I never expected to be where I was—alone. But the reality slowly sank in. The pain didn’t mean I was alone. I had many people praying for me, supporting me, telling me how much they cared even though they were hurting too. Oftentimes we allow Satan to usher us into a place we don’t belong. More accurately, he makes us believe we are in a place we aren’t—like being abandoned by God in the midst of a trial. It isn’t true, but he wants us to buy the lie. As soon as I bowed my head and spoke one word, the name, “Jesus,” a flood of grace poured over me and I was able to feel again. I cried, I stopped feeling sorry for myself, and headed to work. My grief wasn’t over and It wasn’t easy, but it was possible. Grief is a God-given response to loss and shouldn’t be avoided. Instead, it must be respected and observed. It doesn’t mean we wallow in it, making sure everyone knows how horrible or painful our lives are. It means that we allow it to be a part of us for a period of time out of respect for what we’re going through—especially for our loss. We heal, but it takes time. We must allow God to perform His work in us. If you ever think God has abandoned you or treated you unfairly, read Hebrews 13:5. If Satan says God is not there, that He doesn’t care, quote that verse back to him and walk away—Satan’s a liar.